Neodymium ring magnets are strong permanent raw magnets produced in extra high quality. 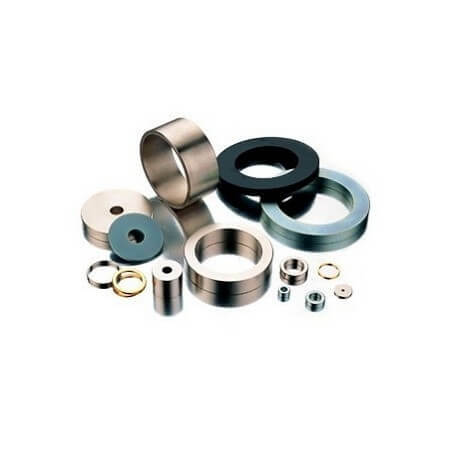 Ring magnets have numerous application possiblities within the industrial business area and the magnets are often used in machinery, production facilities, motors, sensors, display systems, etc. Quality grade N35 is used for the neodymium ring magnets. Please contact us if other quality is needed. Holding force: 10 Newton svarer til ca. 1 kg. Neodymium ring magnets from Larko Magnet are produced as round disc magnets with hole. The possibility of countersunk holes depends on the dimension in question. Please see further information under Sizes and Variations. Thanks to the rare earth neodymium material the ring magnets are some of the strongest permanent magnets in the world. Consequently, they provide companies with multiple application possibilities. Larko’s neodymium ring magnets have undergone a special Ni-Cu-ni treatment which protects the ring magnet and ensures long durability. Neodymium magnets are also produced as disc magnets, block magnets and sphere magnets.